A pile of presents, wrapped and ready to go. Oops, one of the books is peeking out. 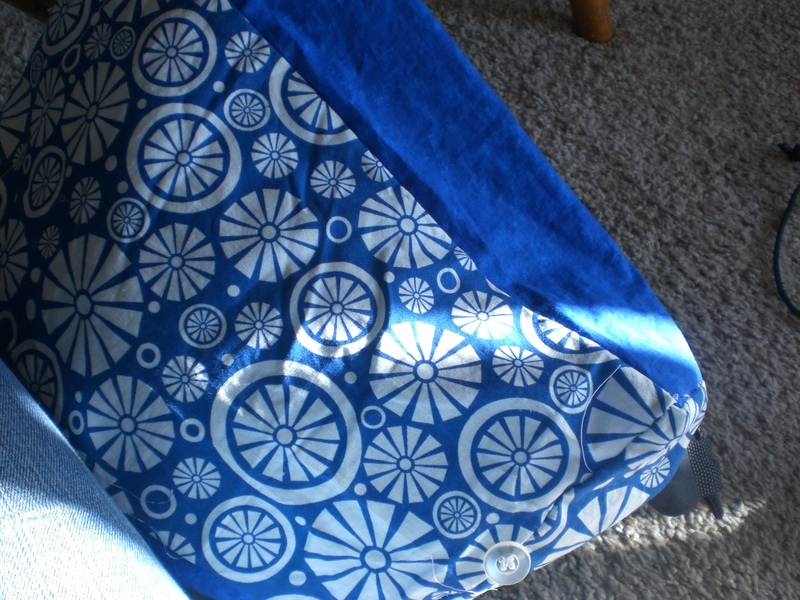 Last year at Christmas, I was appalled at how much wrapping paper got thrown away, as I have mentioned before, so I decided to make some bags, and use scarves to wrap other presents, Furoshiki style. I have been buying scarves every time I go to thrift stores, but I put off making bags until just a couple of days before Christmas. I’m usually not so good at follow through, but this year, I did actually make some bags for gifts for my immediate family, and some extended family. I think there were only a few presents in paper that came from my house, and a couple of others that were packed in re-used paper gift bags. I was still appalled at how much paper got thrown away, but at least hardly any of it was mine. I always give everyone at least one book, so I wanted adjustable bags with side gussets for thick or thin books, and an adjustable closure. I modeled these after a lunch bag pattern I found in a book. I used a pattern for a lunch bag that I found in “Bend the Rules With Fabric” to make book bags for DH and the kids, and kind of pimped out some of those freebie drawstring backpacks with applique. Last spring, I was given a whole bunch of string backpacks from the Census Bureau. I was supposed to give them to my students, but none of them really wanted one. I couldn’t throw them away, but didn’t want to carry around a census backpack, either. 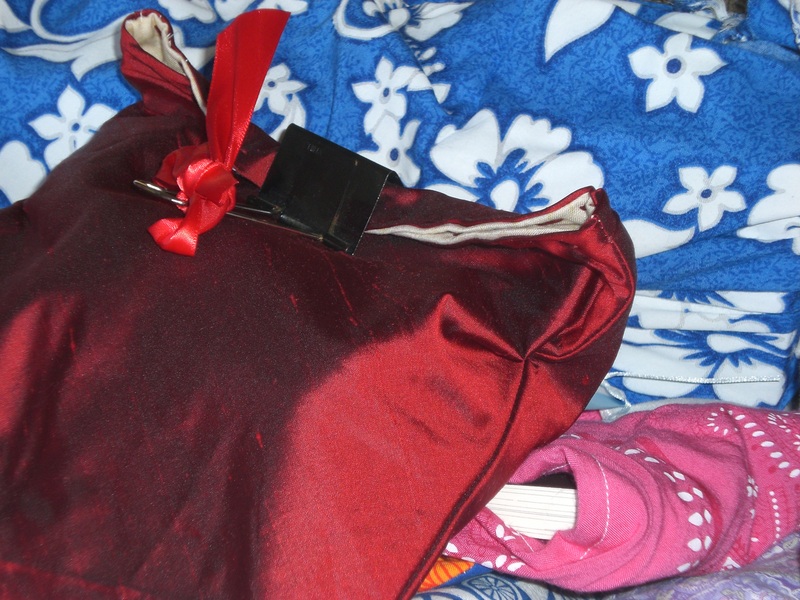 The homemade bag I am proudest of, though, is for my great-niece- I looked at the construction of the freebie backpacks, said to myself, “That can’t be too hard” and whipped one up for her in red velvet. She’s going to be 4, she needs a red velvet backpack! 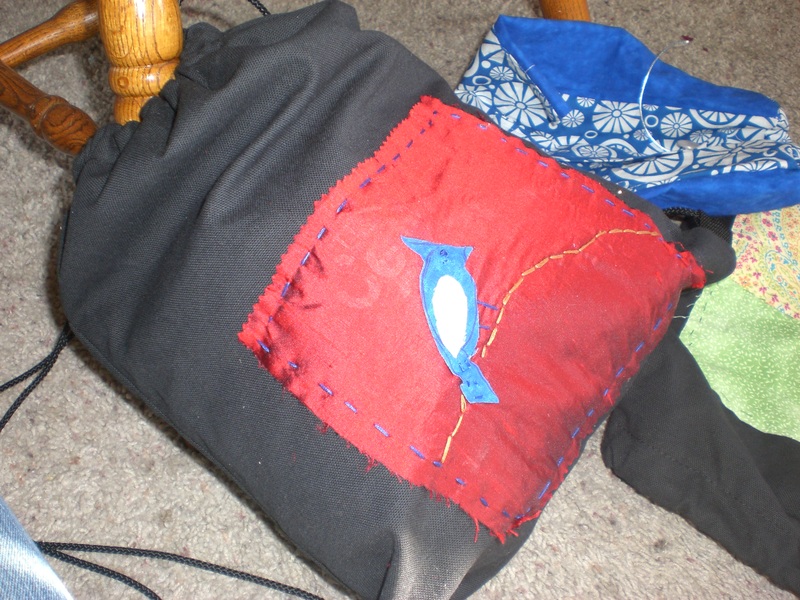 I stitched a square of red silk onto this canvas backpack, then cut out a bluejay, freehand. It took me a couple of tries. I mostly wanted to cover up the logo on the bag. This is brilliant….I’m a reuser, big time.As much paper and ribbon as I can recycle, I do. But we have two boys under 5 and the ripping was part of the fun this year…That will last for a bit, but not for too long. Soon they will be like me…one of those annoying people who always wants to save the wrapping. I understand about the ripping- one of my nieces loves ripping so much, that I sometimes double wrap hers, so she can rip two layers. They also love the silk scarves, though. I wrapped my nephew’s birthday present in a purple silk scarf, and all through the party he ran around with it as a cape. When Noah was born, one of my co-workers wrapped his gift in a soft blanket with a grosgrain ribbon and then put a little stuffed doggie as the bow…it was the CUTEST package there!